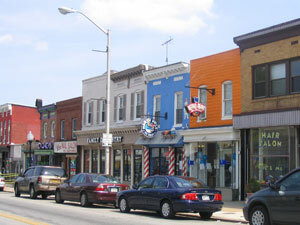 The Highlandtown Business District, in southeastern Baltimore City, is a traditional neighborhood strip commercial area. In earlier times, it contained the largest concentration of retail activity outside of Baltimore City’s downtown. In 1993-4, in a period of lagging business, Urban Information Associates was asked to carry out a market study on behalf of the Highlandtown Merchants Association, which had a limited budget for such an effort. The goals of the study were to identify the market potential of the area and to recommend marketing strategies to curtail recent sales declines, increasing store vacancies and other negative trends and to enhance the Highlandtown Business District as a community shopping area. UIA agreed to undertake the study, conditioned on the active participation of volunteers recruited by the merchants association. A household survey of the larger market area to identify other shopping destinations of Highlandtown area consumers. This survey was designed to help pinpoint attractions/impediments to shopping in Highlandtown. A merchants survey to establish baseline information on the current mix of retail and services, the square footage in retail use, and the extent of vacancies. Also included were the views of merchants regarding the positive and negative influences on the business district. The final report summarized the key findings and recommendations, including actions to be taken by public agencies and actions needed to be taken by merchants and property owners.